The need for conscious and creative leaders in our political system is abundantly apparent. Our President-elect has consistently demonstrated a lack of self-awareness and emotional intelligence, understanding of others and respect for diversity, contextual knowledge and regard for complexity. This approach to leadership runs deeply counter to the mission of Owl, Fox & Dean and the values that we stand for. I started Owl, Fox & Dean because I believe that through the conscious development of people, the thoughtful design of organizations, and the sharing of knowledge, we can make the world more happy, resilient, and well. I wake up everyday fueled by this belief and energized by deep passion for helping people develop as conscious humans, and grow their positive impact on the world. As an active commitment to my community and the mission of Owl Fox & Dean, I am offering free coaching to aspiring politicians who are seeking to develop their leadership capacity. You can learn more about me and my to coaching here. If you are considering or planning on running for office and you want to make your community, our country, and the world a better place, please be in touch. cases of customers having an extremely painful experience when they attempt to connect with an actual person at the company. In short, connection is being sold externally, but the brand is not being embodied internally. We'll be releasing more information about the model and tool in September. Until then, we hope to see you there! When we first started to talk about our move out east this coming summer, many Portlanders had a similar reaction: a facial expression that could only be described as a cross between utter disbelief and abject horror. [ERROR: cannot compute] was plastered across their faces. And I understood. Portland is a truly special place, and it has become my home, in all of the best ways possible. Moving here nearly four years ago to start a romantic relationship with unknown prospects, I was just a little bit nervous. Portland was a tough place to find a job post-economic downturn, and, well, it rained for 9 months of the year. But I came to deeply love and appreciate this little western outpost for all of its incredible quirks and charms (yes, even the rain), and simultaneously, Portland’s renown skyrocketed and it became the hotbed of culture, food, and creative lifestyle that it was always meant to be. One way to understand the health of your organization is by studying the interactions of your teams. What does the body language of the group tell you? What percentage of people are late to meetings? How often? What is the level of resolution and confidence after meetings? What is the level of active follow through after meetings? What is the level of preparedness among the group? What does the tone tell you? What is the mood of the group? What is the level of collective understanding among the group? How do you feel when you leave a meeting? Teams, projects, and companies can be made or broken through effective or poor interactions. I’ve seen it go both ways. 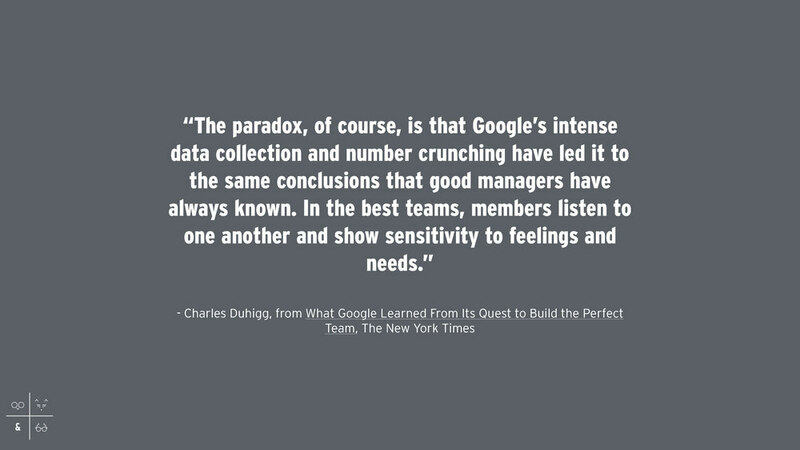 The recent New York Times Magazine issue on work put this dynamic in context with an article about Google’s exhaustive effort to understand what makes good teams effective. "A shared belief that the team is safe for interpersonal risk taking." I find it important to discern between safety and comfort. Just as we must discern between happiness and being content. We get comfortable with our team members, we drop our professional guard, and fall into patterns. 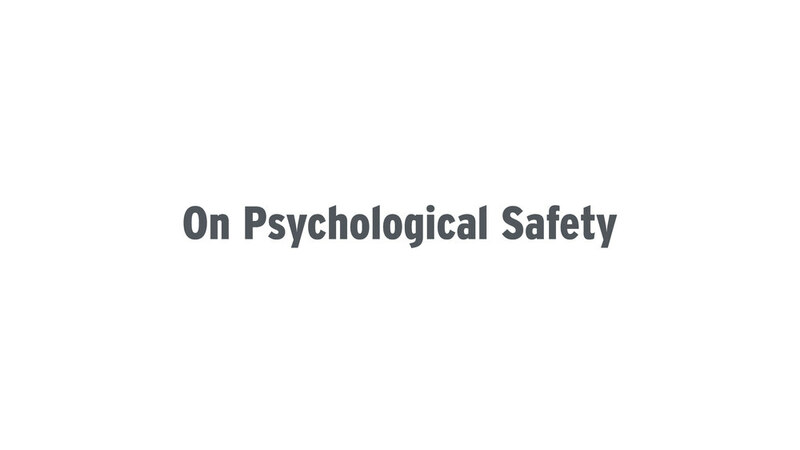 This may start out as a step toward psychological safety but over time, without thought, you can find yourself cycling through a pattern of comfort. Comfort does not equal safety. A past client of mine said it well; if you’re in a relationship, you can’t just always go home and eat in front the TV, sometimes you have to get dressed up and go out to a nice dinner to reinvigorate things. What I hear in this is that it’s important to be comfortable with the people you work with and it’s critical to be intentional about how you’re engaging with one another. Whether you are kicking off a new project, meeting with your team for the hundredth time, or engaging your colleagues on a special project, you have the opportunity to thoughtfully design a safe interaction. The space we meet in is often an after-thought. We shuffle into conference rooms, choose a seat around a table, put all of our things out in front of us, and get to it. This is okay for routine meetings once safety is established but when a team is forming and intermittently throughout the course of a project - it's important to remove distractions and obstructions and connect more deeply. 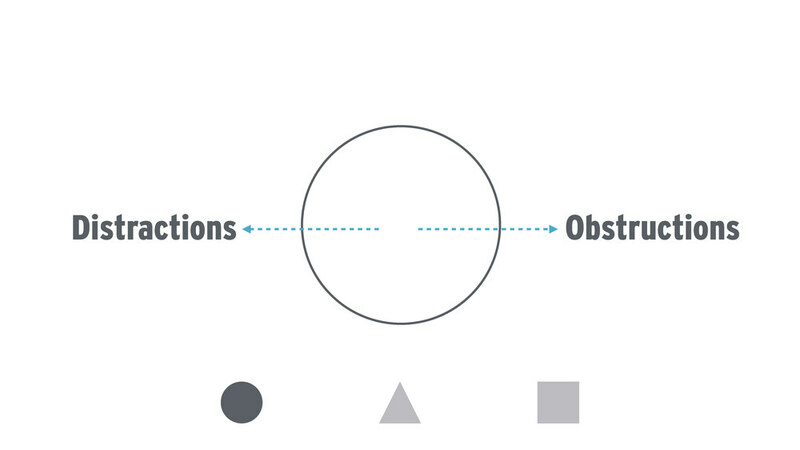 When designing your meeting space, consider the circle. A circle is a powerful tool and I've had the honor of being part of powerful circles. The circle forces you to show up and be present. Arrange chairs in a circle so that everyone can see one another when seated. Remove any objects from the center that distract or obstruct. This includes tables, computers, projectors, wires, and cables. The Storyteller engages the group by giving context and establishing a dialogue. The Observer engages the group by reading the participants' focus and energy and modeling physical presence and body language. The Inquirer engages the group by asking really good questions that help participants understand the context more deeply and inviting people to speak up. These three roles can be played three individual people, three groups of people, or one person. The goal is for each of us to develop the ability to play all three roles and understand when each is needed. Context: What are we talking about and why? Time-frame: How long will this conversation last? Agreements: How will we engage with one another? I hope that these tools allow for improved interactions on your team. 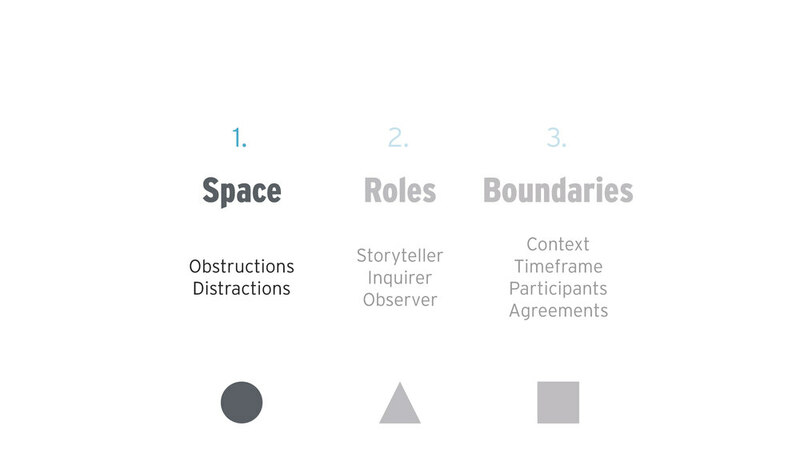 I hope that you become so damn intentional with how you design meetings, engagements, and interactions. The Simple Planning Tool is our solution to simplifying the process of going from idea to action. It's at this point in a project, strategy, or change effort that we see people and teams get stuck. Its companion is the Personal Leadership Canvas and it’s based on the same orientation within time and space. We have found that much of the conflict we see on teams comes from overly complex planning processes and differing definitions of terms like "goals," "milestones," and even "plan." Seriously. These small misunderstandings of the meanings of common terms accumulate and derail meetings and strategies. Think of it in terms of a flight path metaphor; if something knocks you off course by a few degrees, you'll be way off course as you accelerate through time and space. This is why we build our tools so that they are oriented in the same framework of time and space. What will you do to meet those needs? These four questions relate to the four elements of the tool. What's important is the clarity of each answer and the relationship between the elements. Before you get to the elements, it's important to define the context. What larger strategy is this plan a part of? Are you working to build a stronger culture within your organization? Are you planning an annual staff retreat and want to ensure that there's increased cohesion on your team afterward? Are you mapping out your quarterly sales goals? Whatever the context is, define it, give it a name. This is the date that you will begin taking action on your plan. Often it's also the same day that you are using this tool. This is the time frame in which your plan will be executed. Pick something and stick to it. Three months? One year? Thirty years? Your vision is a future state of being. What does this future state look, feel, and behave like? What are the outcomes? Describe it in detail. What's important here is that you and your team actively imagine a future state being within the same context. In order to actualize this vision, what do you need and what needs to occur? Some needs will be more complex than others and involve dynamics that are out of your control. You will be able to meet some needs on your own, some will require the help of others, some will be a whole team effort. Define needs in relation to each aspect of the vision. Strong commitments equate to clearly defined action over some amount of time and relate to specific needs. Both variables of time and action are critical. Make actions specific and achievable and define both the frequency and duration of time for each commitment. Commitments are the exact things that you will do to meet each need. To ensure that ... occurs, I / we will ... once per ... for the next ... months. If your organization has a defined core purpose, write that down. If your team has a defined purpose, write that down too. At minimum, answer the question: why is this strategy important to you and the organization? While vision is a future state, purpose is always in the present as you move through time and space. Action starts here. Pressure test each of your commitments to ensure that they relate back to purpose. The likelihood of follow through will increase if every action is rooted in a deep sense of purpose. We designed this tool to be something that you can use on your own or with your team. You can use it to develop what you defined in the Personal Leadership Canvas and you can use it with your team to plan how you'll execute on your strategy. Be specific and clear with what you define for each element. We hope this tool helps you understand exactly what it takes to achieve your vision and execute your plan with a deep sense of purpose. Have fun with it and let us know how it works for you. Download the Simple Planning Tool. The day that I turned 18 years old, my worldview changed dramatically. That day was September 11, 2001. Before that day, I viewed the world as big, safe, and full of opportunity. After that day, the world appeared small, scary, and lacking opportunity. This pivotal event, along with the financial crisis that began in September 2008 (the month I started my first business) and the great recession that followed have greatly influenced my perspective on the world, the problems we collectively face, and my role within it. These events represent a systemic failure in leadership and point to the fact that societal change is crucial. There’s clearly a lot of work to do. I share my story and perspective because I believe that many people within my generation have a similar outlook on the world. The opportunities that creativity and design represent are core components of this generational perspective. We entered the economy as design thinking became mainstream, accessible, and synonymous with problem solving. There are big challenges in the world, and we have the tools to help solve them. Where do we start? Where we work. The implication for organizations is huge, as this perspective shapes our views on work: what it should look like, what needs to change, and how fast this change should happen. This new generation of creative leaders is emerging quickly. They are eager, energized, and enthusiastic to grow personally and create change, yet they often struggle to integrate into organizations. The irony is that many corporate executives and older employees struggle to utilize this young talent and harness their energy. Because of this, many organizations are stuck. There’s a clear tension between generations, and it stems from a differing sense of urgency, patience, and understanding the other’s perspective. In many companies, this tension is at unhealthy levels and is putting great stress on individuals and teams. Younger employees appear entitled and impatient, while older employees appear stubborn and dismissive. If it is not addressed, this stress can result in deep conflict, lack of cohesion, lost productivity, and decreased profit. Creativity thrives within healthy levels of tension. Tension thrives whenever there are humans working together. Within the context of work, individuals and teams are at risk of burnout if that tension is not managed effectively. The success of teams can range widely. Sometimes a team is cohesive and productive. Other times, the same team operates as if it is on the brink of collapse. People are complex, creativity can be fleeting, and the creative process can, and maybe should, be messy. Much of my work with organizations is focused on harnessing organizational tension to increase the health conditions so that companies can innovate, transform, and grow. With organizations that are experiencing this generational tension, this looks like developing emerging leaders, helping executives understand their young talent more deeply, and designing systems to support continued learning, development, and efficiency. Organizations that have an integrated discipline of design are uniquely positioned to leverage this tension to increase value creation and organizational capacity. In this article, I’ve outlined three things you can do to leverage this tension and focus creative energy on improving your organization to drive innovation and growth. I use examples from my work with clients to frame what these strategies can look like. I also use examples from the media to highlight why developing and focusing creative talent is important. 1. Embed the practice of leadership as a discipline across all levels. My team and I recently worked with a digital creative agency that, after rapid growth, wanted to focus on efficiency and develop their talented “doers” into leaders. We delivered a custom leadership development program for more than 65 of their staff and designed strategies to integrate leadership as a discipline into their organizational architecture. I’ve seen the practice of leadership have a major impact on the collective output of teams and the financial and cultural health of companies. This impact is most visible within the interactions and relationships between individual team members and is made possible by a healthy environment that supports the creative process. Think about a creative team as a brain and each member of the team as individual neurons. Neurons communicate by sending signals through synapses—junctions or pathways between cells. Consider these synapses to be the relationships among team members, and each signal sent as individual interactions. To communicate effectively through its synaptic pathways, each neuron must be adequately nourished and must exist in a healthy environment. It’s been widely proposed that omega-3 fatty acids (found in fish oil) are essential for helping to produce and maintain a healthy brain. They provide neurons and synapses with the nourishment required to function. By consuming omega-3s, we are helping to create a healthy environment that allows for our neurons to communicate effectively, which leads to increased cognitive capacity and greater function. Figure 1: A simple representation of a team with individual team members in various colors having different levels of leadership capacity. 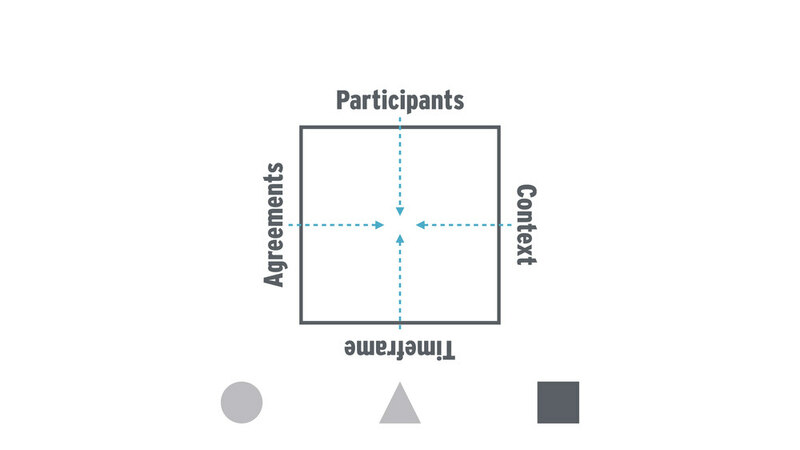 The grey center represents the collective output of the team. Let’s think about this in terms of the practice of leadership within a team. I define the practice of leadership as the act of increasing your capacity to understand yourself, your relationships, and the context in which you operate in order to influence each of those things in a generative way. Figure 2: This formula can be translated into a simple 2x2 matrix. The horizontal axis represents capacity to understand and the vertical axis represents capacity to influence. Optimal leadership capacity is pictured in blue in the upper right quadrant. As with the topic of millennials in the workforce, there’s an incredible amount of information and literature on leadership. Some of it is excellent. Some not. Much of it is focused on traits and qualities that represent a steady state of “being a leader” and is modeled after what leadership has looked like in the past. This can be dangerous, specifically as it relates to diversity within organizations. After the US men’s soccer team beat Ghana in last year’s World Cup, Delta Airlines posted a photo on twitter of the Statue of Liberty overlaid by the number 2 next to a giraffe overlaid with the number 1 to represent the final score of the match. Cue Twitter backlash pointing out the fact that giraffes do not live in Ghana. It’s through the practice of leadership that you develop a critical aspect of your leadership capacity: your voice. Your voice is what you choose to express to others. It’s based on your story and your perspective. You see, feel, hear, and perceive things. You learn things over time. You build knowledge and form your worldview. This is what informs your voice. As you form and understand your perspective, it’s your responsibility to find the most authentic, appropriate, engaging, and effective way to share it with others. No one who was responsible for creating and publishing this content knew that giraffes do not live in Ghana and that this post might be offensive. Someone did know that giraffes do not live in Ghana and that the post might be offensive—and didn’t speak up. Someone did know, and did speak up, but was disregarded. Certain individuals lack the capacity to speak up when necessary. It’s critical that your team members speak up. This responsibility falls on each individual as well as the team, collectively. There is a lack of regard for certain voices on the team. It’s crucial that all voices on a team are heard. It’s in the best interest of those who are tasked with making decisions to listen to the voices in the room. In a diverse and complex world, creativity and innovation depend on diverse and complex perspectives that are voiced and regarded. The success of teams depends on the ability of individuals to understand and influence. Figure 3: The same simple team representation is updated to show increased collective output as a result of each individual team member having increased leadership capacity. Your organization’s ability to innovate and grow is directly reliant on the health of your teams and their capacity to effectively communicate and produce. You can take an Omega-3 supplement once in a while—it won’t do much for you. You can engage your teams in a leadership workshop once in a while—the same is true. The long-term health benefits of integrating foods that are rich in Omega-3s into your diet will have a tangible effect on your health and well-being. The same is true if you can establish leadership as a discipline that is consistently practiced and that permeates every function of your company. By making leadership a practice that everyone has access to, you’re giving young talent the time, space, and capacity to understand the organization and influence its direction in a more focused and productive way. Consider leadership development within your organization to be as essential as the development of technical skills, the adoption of new technologies, and the efficient management of projects. 2. Actively develop young employees to accelerate organizational learning. Start developing the capacity of your young employees early. The competencies that come from a disciplined practice of leadership and personal development are critical at any stage of a career and will increase the efficiency and focus of teams. Engage your young employees in dialogue and with coaching and encourage them to develop and refine their understanding of themselves, others, and the organizational context. Your values serve as a foundation. On your path, they allow you to walk on solid ground. It feels good when we live through them, it feels terrible when we act outside of them, and we often feel tension with others when they act against them in our presence. You can also think of your values as an operating procedure. If you were going into a difficult situation, what would it look like to handle the situation by behaving according to your values? Voice begins with your unique story and your perspective on the world. We take in information through our senses; we see, we feel, we perceive things, and all of our past and present experiences inform our unique perspectives. Once you understand your perspective, you have the opportunity and responsibility to find the most authentic, appropriate, engaging, and effective way to share it with others. It’s critical to teams and organizations that a diversity of perspectives is heard and informs the way they operate and the work they produce. Vision is what you literally see as well as what you can imagine as possibility. Think of your vision as the horizon line. It gives us our sense of place and allows us to imagine what can be. It’s important to that you allow your vision to be outside of your current reality— don’t limit yourself by what you think to be possible based on immediate restraints. A tool for defining your vision is the use of boundaries. If you feel stuck or are unsure where to start, put some boundaries of time and context around your imagination—the boundary of one year, for example. Defining your vision is an ongoing practice. The key is to imagine and then act, imagine, and act again. Your purpose is what gets you out of bed in the morning and what keeps you moving. Purpose is closely tied to vision, and it's the relationship between the two that's important. Vision is what you’re working towards; purpose is why that is important to you. Purpose gives you your minimum viable product—meaning that while your vision will take time to build, a clear purpose will allow you to take action immediately. When young employees have a deeper understanding of these four elements, the organization benefits. These elements exist at the organizational level too. As employees define these elements for themselves, they gain a deeper understanding of their place within the organization. I’ve seen this result in staff being reenergized and integrating more fully into the organization and I’ve also seen employees realize that they are not a good fit and leave. In either scenario, the organization benefits from increased cohesion and focus. To ensure that the connection between personal and organizational perspective is made, it’s important to create opportunities to share and direct this understanding within the context of the company. Make sure that individual development is complimented by group learning and shared application. 3. Focus creative tension by forming “special ops” teams to make organizational improvements. A cultural attribute of the graduate program I attended, that I love, is the concept that a complaint is a commitment. Meaning that if you see something that can be improved and you bring it up to the community, you’ve just volunteered to form a team to do something about it. A critical stress point in the tension between generations is that young employees want to have an effect on the organization from the very beginning, while many older employees have worked their way up in the structure and have assumed responsibility over time. These are two mental models that seem to be at odds with one another. They don’t have to be. Let’s go back to the client I mentioned earlier in this article. We found that within that organization, there had been some grumblings about the “employee experience.” To address this, we formed a “special ops” team comprised of employees who were frustrated as well as some that were not. They all had different roles within the organization, and didn’t normally have the opportunity to work together. Using UX design tools, the team interviewed a range of current and past employees and mapped an “employee journey.” They discovered that, depending when someone was hired; there was sometimes a gap of 1-3 months between his or her first day and when they were given important information that related to the culture of the company. This led to a lack of cohesion and a feeling of disconnection for some employees. One strategy that came out of the work of this special ops team was to develop a mentor program that was part of the “onboarding” process. Each new employee is now assigned a peer mentor from within the company, who meets with him or her on that first day to help the new employee better understand the organization. Not only does this help to integrate new hires into the organizational culture, but it also serves to reinforce important aspects of the company with long-standing employees. For those who participated on the special ops team, this activity produced a deeper understanding of themselves, other people on staff, and the organizational context, and it created an outlet for people’s energy that could otherwise have resulted in conflict or attrition. Another example of this approach was with a retail client. During the holiday season, the busiest time of the year, we formed a special ops team to observe where breakdowns were occurring. We met weekly for two hours, outside of the store, to share thoughts and have dialogue on what was observed. During the holiday season, the expectation of this team was to not develop solutions immediately but to collect information that would help redesign systems when we knew that business would slow down and there would be time and capacity to focus on designing solutions. There was significant stress among some employees that was caused by the sense that things were not working as well as they could be and that there was not time or capacity to do anything about it. This team’s focus was to first ‘problem find’ and then, problem solve. After the holiday season, they refocused on designing solutions for what was observed. This approach provided the opportunity for younger employees to learn the value of understanding challenges on a deeper level before designing solutions. Meeting outside of normal business hours and in a different space allowed for the team to understand one another better and for newer staff to develop their voice and share their perspective in ways were not possible while they were “at work.” The focused scope and schedule constraints helped to ease tension among employees who believed that every challenge should be solved immediately. Organizational tension is a powerful force that when focused can improve systems and increase employee engagement. Creating special ops teams that encourage deeper understanding and focused problem solving is an effective strategy to do this. There’s an emerging generation of creative talent that is driven to improve the world - starting with where they work. Let them. Your organization will benefit. While this urgency to improve and develop can cause tension among staff, executives have the opportunity to leverage intergenerational tensions to support well-being and accelerate growth and innovation in their companies. To do this, organizations must embed the practice of leadership across all levels and functions to create the conditions necessary for personal growth, actively develop emerging leaders, and focus creative energy on making internal improvements. Author Posting. © 2009 The Design Management Institute. This is the author's version of the work. It is posted here by permission of the Design Management Institute for personal use, not for redistribution. The definitive version was published in Design Management Review, 26:3, . Founder and Managing Director, Caleb Dean, spoke about leadership in the context of time and space for the Design Museum Boston this summer. The event was hosted by the landscape architecture firm, Reed Hilderbrand, in Cambridge, MA and was part of an ongoing series called Design Museum Mornings.